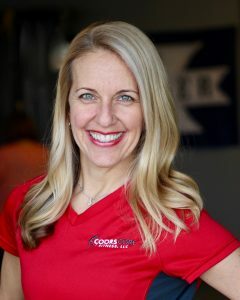 Lisa Coors is the Owner of Coors Core Fitness (CCF), the leading medical fitness studio in the Cincinnati area. Started in 2006, CCF has become the referral source for numerous physician practices and physical therapy centers. Lisa is also a national presenter in the fitness industry where she has presented at Club Industry, Athletic Business Conference, The Sunflower Revolution/ Parkinson’s Symposium and AFPA. She has written numerous publications and is one of the authors for the American Council on Exercise: Medical Exercise Specialist Manual. In 2012, she started the Women’s Fitness Association as a resource to mentor and educate women in the fitness industry. She is also a Member of the Xavier University College of Business Board of Executive Advisors, Xavier University Women of Excellence Committee and the Xavier University College of Professional Science College Advisory Board.